note: if you send a patch to the mopho ,be sure you have a prog name on the panel, if not ,then write one before send patch AND don’t forget to do “saveCtrlr state” to keep the prog there next time the panel will be openened (for standalone). for vst the prog name is saved with the DAW preset file . 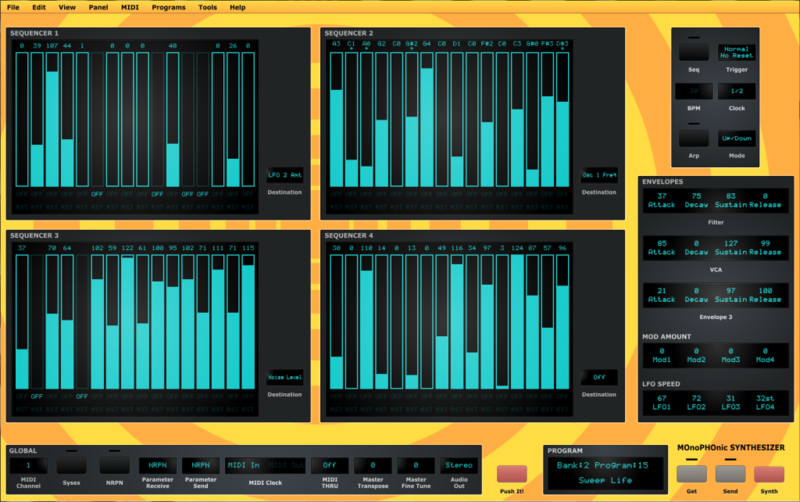 -update08/04/15:LookAndFeel() for all knobs(except lfo speed),different mouse sensitivities are set. -update07/04/15:various,LookAndFeel() only for filter knobs. Hi Zeoka – just playing with your Panel with my Mopho. I had to tinker underneath the global panel settings to configure MIDI ports however I have it working well now. For your info, the problem of Initial Level and OSC1 Frequency being ‘linked’ when adjusted is also happening on my OSX system. I had the same problem with the MKS80 Panel I had made after updating to a more recent CTRLR build which I fixed by making the VST Index settings again for the two effected parameters. I will try to fix this problem on your panel and see if it solves matters. p.s. I LOVE this panel – it is epic! Truly looking forward to seeing how you grow it further. NRPNs are channel sensitive indeed. I get CTRLR to channelize to the synth using the MIDI Through settings (Host -> Device (Channelise) = enabled). Thanks so much for developping! I love the device! having just some troubles with it, I’ve setted everything up, working fine, but as I’m ableton user I had to disable my audiocard midi ports, but the problem now is that all the other midi controller are going crazy, any suggestion? Interesting issue Zeoka – Whenever I send a Snapshot to the Mopho using your Panel it overwrites the Global setting on the Mopho called “MIDI Control: On/Off” – after sending a Snapshot it changes to “Off” (which means that successive parameter tweaks from your Panel are ignored until I manually changing the setting back on the synth (not a show stopper – just a little inconvenient). Wondering if you could fix this in a little update. P.S. your panel is the best out there for Mopho! Hi! guys, I’m using an old version, with ctrlr 5.4.27 I have an error when I move knobs on mopho he say Lau Error – Callback Disabled, anyone is experiencing it? I want really use the newer one any idea, I did something wrong maybe?